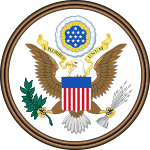 The Great Seal of United States is the official coat of arms of United States, and it is placed in official documents from United States Government. The name is used both for the coat of arms, and the material seal itself, which is made by the United States' executive power. 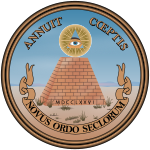 The great seal was used for the first time in the year of 1782. The seal's design is used in national documents, such as passports, by the United States military, and flags. As a coat of arms, it has the national colors of the United States, but the material seal itself only has a basic black and white design (like when used on paper). Since 1935, the two faces of Great Seal appear in the note of one dollar. This page was last changed on 24 May 2016, at 18:25.